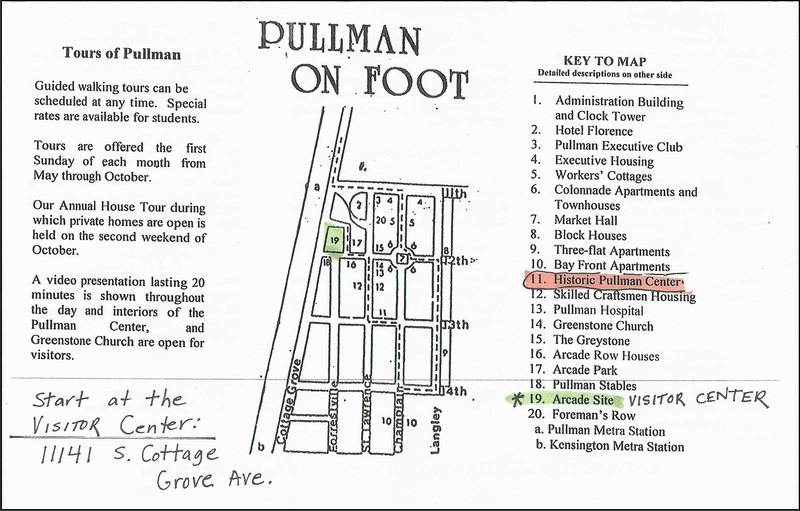 Where it is located: This walk takes you through the heart of the Pullman historic district in the community area of Pullman. It is Walk #12 on the Walks Location Map. How we got there: We drove and parked at the Visitor Center. There is also street parking in the neighborhood. The Visitor Center provides detailed options for travel via car, bus and train. Marge’s Comments: This was one of the first neighborhood walks I took after moving to the city in 2005. I was fascinated by the history of Pullman and knew that much of the “town” exists intact from when it was built in 1880 – 1884. Walking among the well preserved row homes once occupied by the workers of the Pullman factory helps you envision what life in Chicago may have been like over 100 years ago. The Visitor Center is a must see and greatly enhances your experience. The factory is a burned out hulk of a building and other sites are in shambles, but the future looks hopeful. The area has been gentrifying since the late 1900s, the district was declared a National Monument in 2015 and the commitment to restoration among community groups gives hope that the area will one day be restored fully. The Pullman neighborhood is a spectacle: one part ruins and one part rising Phoenix. The ruins of the manufacturing complex that was absorbed by Chicago over a century ago is a humble reminder of man’s fate. In the adjoining neighborhood, once owned by the company, urban frontiersmen have made a delightful and safe haven for themselves. Down 111th Street and across I-94 the magnificent Harbourside Gold Course offers 36 holes, each with a breathtaking view of Chicago in the distance. This walk is very limited in that it takes place in the very tight area around the visitor center. If you are inclined to wander beyond it, please ask at the visitor center where to go, what to see and what is safe. They are very knowledgeable about the area and are very helpful. 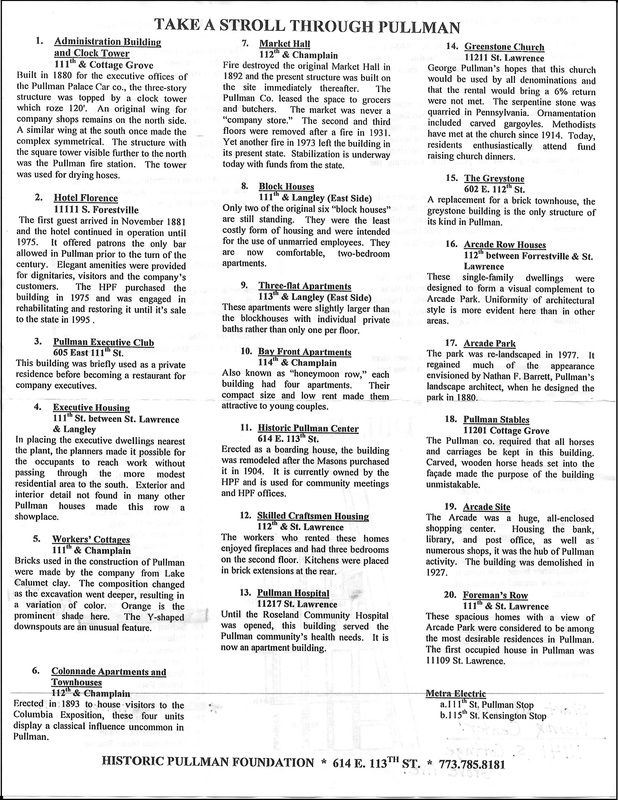 There are guided walking tours of Pullman on the first Sunday of every month from May to October. 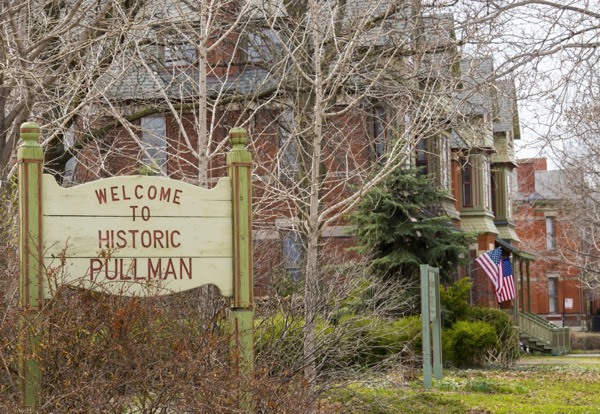 In addition, there is an Annual Historic Pullman House Tour weekend, where homes and sites in Pullman are open to the public. This is fabulous and gives you a chance to see inside some beautifully restored houses as well as the Florence Hotel and other historical sites. Highly recommended! However, if neither of those options fit with your schedule, you will still enjoy going to the Historic Pullman Foundation Visitor Center, browsing their exhibits and taking the self-guided walking tour with the map they provide. This map is reproduced here and makes up our walk for Pullman. 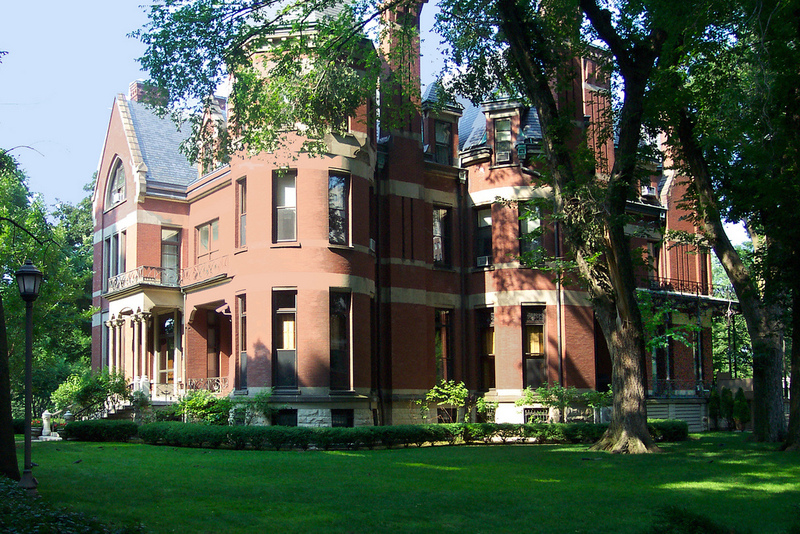 This walk covers only the Pullman Historic District, also known as the Pullman National Monument. It was the first model, planned industrial community in the United States. 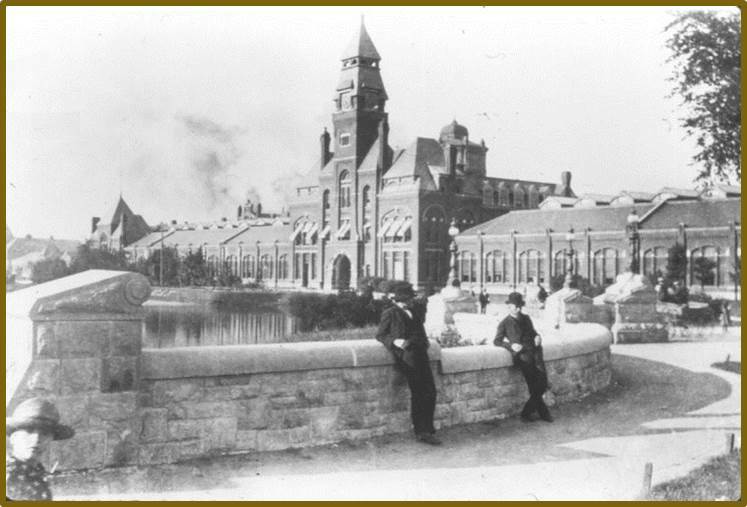 The district is significant for its historical origins in the Pullman Company, one of the most famous company towns in the United States, and scene of the violent 1894 Pullman strike. Historic Pullman was built in the 1880s by George Pullman as workers’ housing for employees of his eponymous railroad car company, the Pullman Palace Car Company. He established behavioral standards that workers had to meet to live in the area and charged them rent. Pullman’s architect, Solon Spencer Beman, was said to be extremely proud that he had met all the workers’ needs within the neighborhood he designed. The distinctive row houses were comfortable by the standards of the day and contained such amenities as indoor plumbing, gas and sewers. During the depression that followed the Panic of 1893, demand for Pullman cars slackened. Despite cutbacks and wage reductions at the factory, the Company did not reduce rents for workers who lived in Pullman. 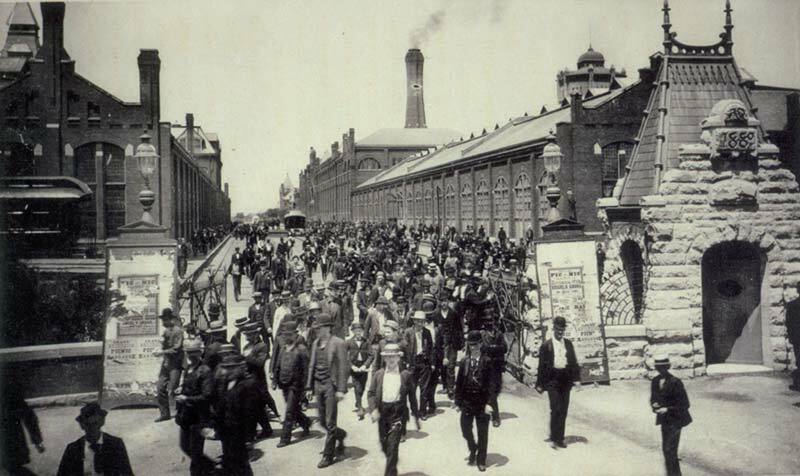 Workers initiated the Pullman Strike in 1894 and it lasted 2 months, eventually leading to intervention by the U.S. Government and military. After George Pullman died in 1897, the town was annexed by the city of Chicago and the city sold the houses to their occupants. Deindustrialization and migration to the suburbs led the area to fall into decline and a proposal to demolish the area to create new industrial development was defeated by the efforts of its residents. Over the years local organizations and foundations have fought and won for recognition of Pullman as a Historic District and all the protections that brings. Length of Walk: The main walk is 2.5 miles. There are 4 “Add Ons” you can add to the main walk which are about one block each. If you string them all together into one route you will walk about 7 miles. Alternately, you could drive to each “Add On” of interest and walk the individual block. 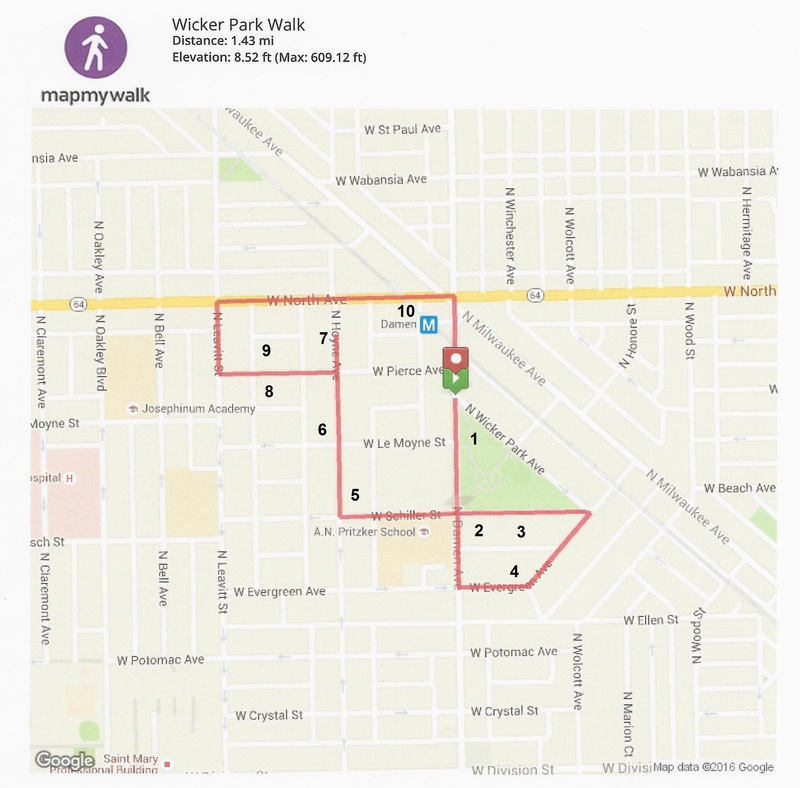 Where it is located: This walk will take you through the community areas of Beverly and Morgan Park. It is Walk #8 on the Walk Locations Map. How we got there: We drove and parked on the street. There is free and plentiful street parking everywhere along this route. Metra has five train stops within a couple of blocks of the walk. You can check your options with the CTA Trip Planner. Marge’s Comments: Take this walk on a beautiful summer day when Beverly is at its best. Lush landscaping and beautiful homes on the ridge make you want to pack your bags and move here. The residents take pride in the rich history of the community which you will notice by all the historical plaques displayed prominently in the front yards. This was the hardest walk to edit and I hope you will use the resources below to read up on the area and add even more stops to your excursion. There is a cute little neighborhood cafe in the middle of your walk: Ellie’s Cafe. Stop here and enjoy watching the locals coming, going and socializing. Ed’s Comments: Many Chicagoans feel that the south side is scary and alien, a foreign place where the higher the street number the more dangerous. Two steps into this enchanting neighborhood and you will realize how foolish this notion is. Beverly competes with all the top suburbs for beauty, stateliness, and significance. The drive out there takes a few minutes but the train ride is a breeze from the loop. It is well worth the effort. 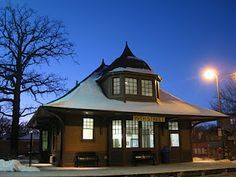 Like many of the community areas of Chicago, Beverly and Morgan Park developed in the late 1800s when rail service was extended to the area. Prior to European American settlement, the area was home to the Potawatomi Indians. The natural beauty of its position on the ridge allowed the community to become an exclusive streetcar suburb, and the homes and large lots reflect this historic distinction. Beverly is located on the highest elevation in Chicago and is one of the most racially and diverse neighborhoods in the city. It is home to a large Irish-American/Catholic community and many Irish establishments. Its yearly South Side Irish Parade is the largest neighborhood parade of any type in the country. The hilly terrain of the area is due to its location in the middle of the geological formation known as the Blue Island Ridge. In its early years, Beverly and Morgan Park were known as North Blue Island. Beverly is one of the top five largest historic districts in any major city in the U.S.
Because there is so much to see in this area and walking a continuous route among all them would total about 7 miles, I developed a base walk in the heart of the Longwood Historic District of 2.5 miles and itemized other “Add On” walks which you can add to your walk or drive to and walk the block listed. The house was owned for many years by John S. McKinlay, president of Marshall Field and Co. It is now the official residence of the president of Chicago State University. Home of S.E. Thomason, a noted newspaperman and co-founder in 1928 of the Daily Times, Chicago’s first tabloid newspaper. A boulder and bronze marker were placed in 1928 at the point where the Vincennes Trail descended the ridge approaching Fort Dearborn. The Trail, originally a major Indian trail, was one of the most important roads leading into Chicago and played a substantial role in the city’s early development. Henry Belding was a prominent manufacturer connected with the soap company of the same name. This also marks the site of the “Upwood” farm of Thomas Morgan, one of the area’s original settlers. Stones from the farm’s sheepcote were used in constructing the present home. W.M.R. French was prominent in artistic circles in the city and one of the first directors of the Chicago Art Institute. A frieze on the porch is by his brother, David-Chester French, designer of the Washington Monument. From 1897 until 1910, the home of John H. Vanderpoel (1857-1911), a noted painter and teacher. Vanderpoel was head of the instruction department at the Art Institute of Chicago, author of the standard instructional work The Human Figure, and a member of the British Royal Academy. A street, school, and public art museum in the district are named in his honor. The largest concentration of small-scale, Prairie-style houses in Chicago. Seven of these residences were designed by Walter Burley Griffin, an architect who began his career with Frank Lloyd Wright. An eighth Prairie-style house was designed by Spencer and Powers. So-called “builders’ houses,” which were constructed by contractors from plans popularized in building magazines of the same period, complete the street. Built in 1912-13 for Samuel J. Wells by architect Walter Burley Griffin. Wells was R.L. Blount’s (builder of the Griffin Houses in this district) father-in-law. Salmon rented the house until purchasing in 1917. Blount worked in real estate for the Continental Bank and also built and sold homes on his own. He was responsible for all but one of the extant Griffin houses in the district. Blount originally intended the house as his own residence but sold it before completion to Garrity, president of the National Plumbing and Heating Co. Built in 1911 for R. L. Blount to plans by architect Walter Burley Griffin. Van Nostrand was a salesman who rented the house before purchasing it in 1916. What is here: These old historic homes are in Morgan Park and this stop gives you a little feel for Morgan Park and its history. Thomas Lackore was a relative of the area’s first permanent settler, DeWitt Lane, and scion of the Lackore family prominent in the early settlement of the ridge. Ferguson was president of the Lancaster Insurance Company. The second owner, Henry Crosman, was a prominent Chicago industrialist and one of the founders of the Chicago Opera Co.
Dr. German was the first physician in Morgan Park and one of the village’s most prominent citizens. Blackwelder was president of the Niagara Insurance Company, which adjusted many losses from the Great Fire of 1871, and president of the village of Morgan Park. His wife was very active in local affairs and was the first woman to vote in an election in Cook County. The house is sited on a four acre lot, largest in the historic district and one of the largest residential lots in the city. American System Built Houses: Based on his long term interest in affordable housing, influential architect Frank Lloyd Wright developed a series of prefabricated housing designs marketed under the name “American System Built Houses.” The building at A. 10410 S. Hoyne was erected by Burhans-Ellinwood & Co. as the model home for a subdivision to be comprised of these residences (1917). The only other Wright designed house to be built, before the project was abandoned at the outset of WWI, is at B. 10541 S. Hoyne (1917). It was built for H. Howard Hyde, a cashier at International Harvester. It is believed that about 25 System-Built Homes were constructed, but only 15 survive. New ones are discovered occasionally, not surprising when you consider Wright and his partner had a falling out over fees and commissions and Wright’s plans could have been used and undocumented to avoid paying him his fees. They can be found in Wisconsin, Illinois, Indiana and Iowa. 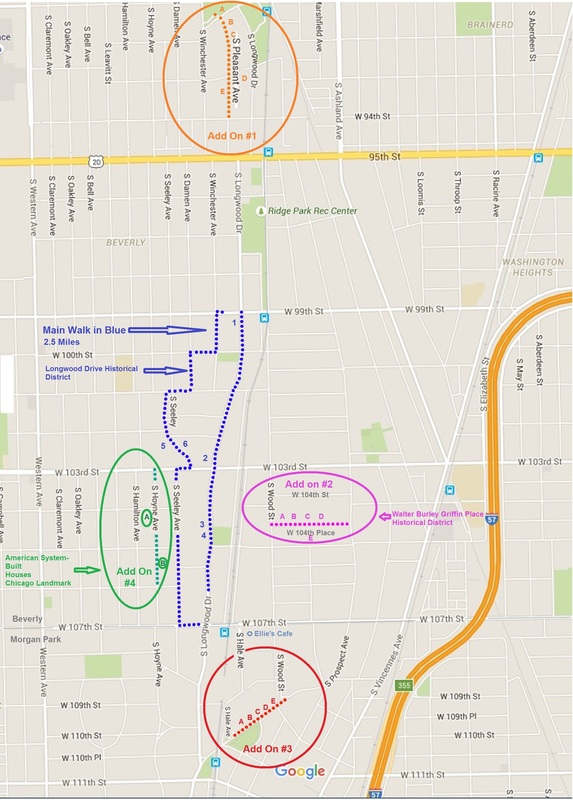 Where it is located: These walks take you through the Gold Coast neighborhood of the Near North Community Area of Chicago. It is Walk #7 on the Walk Locations Map. How we got there: There is limited parking in this neighborhood and it is expensive. Check Spot Hero or look for parking lots on Google Maps if you are determined to drive. The area is well served by public transportation and taxis are abundant. This area is one of the most beautiful in the city. Historical mansions line leafy, quiet streets, yet it is a quick walk to many restaurants and exclusive shopping. It is no wonder the city’s wealthiest residents call this area home. There are many options for touring this neighborhood. The Chicago Architectural Foundation conducts walking tours here as well as several other companies. Rather than reinvent the wheel, I list links to two options below for self guided walking tours; one from Frommer’s and the other by MetrowalkZ. Tourists from all over the world throng to this popular and storied neighborhood. A short walk from Michigan Avenue with restaurants galore, what better way to spend a free morning or afternoon. The highest property values in the city insure that these mansions and town homes are distinctive and in mint condition. The Gold Coast neighborhood grew in the wake of the Great Chicago Fire. In 1882, millionaire Potter Palmer moved to the area from the Prairie Avenue neighborhood on the city’s south side. Other wealthy Chicagoans followed Potter into the neighborhood, which became one of the richest in Chicago. 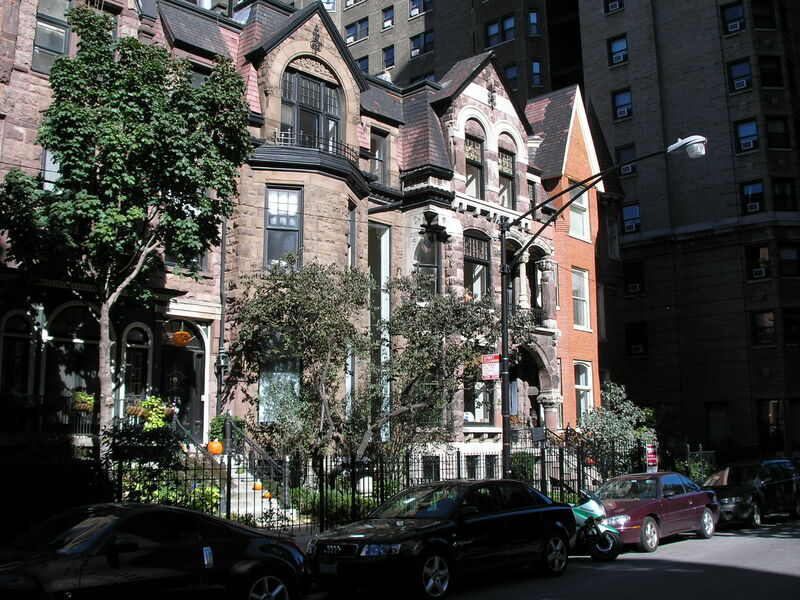 In the late 1980s, the Gold Coast and neighboring Streeterville comprised the second most-affluent neighborhood in the United States, behind Manhattan’s Upper East Side. Today, the neighborhood is a mixture of mansions, row houses, and high rise apartments. Highlights include the Astor Street District and the James Charnley House. This walk is delightful for a late summer afternoon. Walk through the peaceful historic district of Jackson Park Highlands taking in every residential style imaginable from the early 20th century. End your day by driving over to the South Shore Cultural Center and walking through the grand restoration of this former country club, now owned and operated by the Chicago Park District. If the Parrot Cage Restaurant is open, you may be lucky enough to get a table outside with expansive views of Lake Michigan. Just imagine that you have 80 acres of undeveloped land just south of the White City at the 1893 Columbian Exposition and decide to develop it for the elite. The result is the Jackson Park Highlands neighborhood. Today these few blocks are an oasis of stately well kept homes nestled into a changing and challenging neighborhood. You won’t believe this secret has been so well kept. The first to populate South Shore were German truck farmers who raised vegetables on small farms for sale in what was then the distant city. When the area was annexed to the city in 1889, city services extended into South Shore, spurring residential development. The opening of the University of Chicago and the World’s Columbian Exposition in Jackson Park in the 1890s also had a huge impact on the entire South Side Lakefront. The 1890s and early 1900s saw South Shore’s evolution into a full-fledged middle and upper middle class neighborhood. The 1906 founding of the South Shore Country Club established a popular social anchor for the area and contributed additional cachet to the South Shore community. The Jackson Park Highlands came into being on August 3, 1905 as an eighty acre subdivision whose initial development was spearheaded by Chicago alderman, lawyer and real estate entrepreneur, Frank Bennett. The majority of houses, built between 1905 and 1940, reflect the rich and diverse forms and fashions of American residential architecture for 20th century single-family homes before WWII. The Jackson Park Highlands is notable for its well preserved residential architecture for a formative time in American Residential Architecture. At the turn of the century, architects tended to follow one of two courses, either reviving styles of the past or working in styles that were innovative and progressive. Revivalist architecture reached its height of architectural excellence during the first 29 years of the 20th century, when Beaux Arts schooling provided traditionally trained architects of great skill, and the stock market had not yet eliminated most of their clients. Do a quick drive by (red dotted line) of these two notable sites before starting the walking tour of the Jackson Park Highlands (where blue dotted line starts). This house is notable as it is the only known work of Van Bergen left in Chicago. Van Bergen was a disciple of Frank Lloyd Wright and one of the most important contributors to the Prairie School of Architecture. Also notable in this house is the remarkable state of preservation. Probably no other Prairie School house in Chicago remains in as pristine condition as the Allan Miller house. Drive the route of the red dotted line and park your car near stop # 3 on S. Cregier where the blue line denotes the start of the walk. 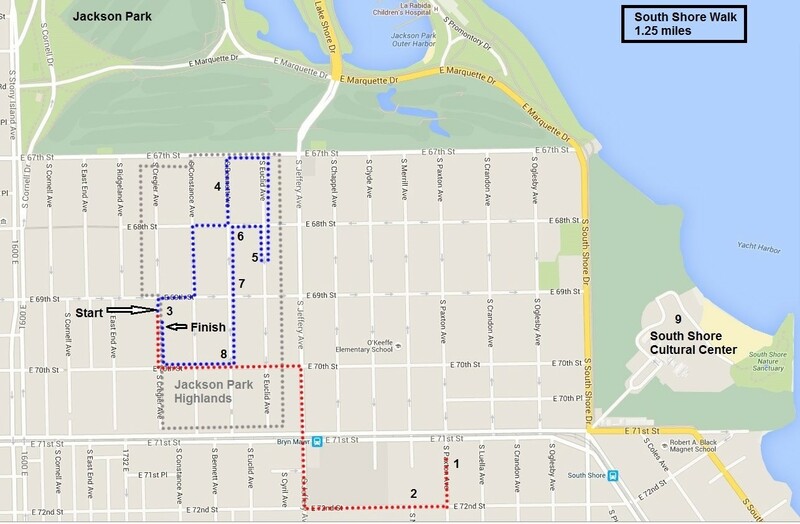 The numbered stops 3 – 8 are some notable homes in the Jackson Park Highlands. I just picked a couple from the Chicago Landmark Designation Report . You may want to research others from this report to add to your walk. Phillip Maher incorporated the details of a picturesque English rural house type, the Cotswald Cottage, which is identified by its steeply sloping roof make of simulated thatch. 4. 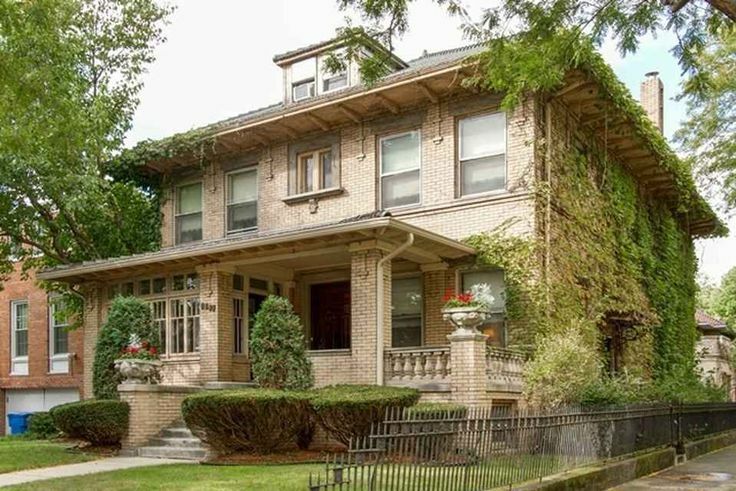 6734 S. Bennett Avenue, Distinctive and featured on the 1922 cover of the Chicago Architectural Exhibition catalogue. While most houses were either traditionally academic or progressively modern, this house is an adroit amalgamation of stylistic references from both major trends. The long, low lines of this one story house, which mimic the flat horizontal lines of the Midwestern Landscape, are directly derivative from the Prairie school pioneered by Frank Lloyd Wright. The horizontal rows of windows, the massive masonry porch supports and the flattened pedestal urns are also Prairie style trademarks. From the California Craftsman style of Greene and Greene, which like the Prairie style was inspired by the Orient, come the multiple roof planes and peaked roof line of the two front gables. Turning to the past, the architects employ false Tudor half-timbering for a decorative effect, and a Renaissance classical balustrade bands the front terrace. This style has had a lasting attraction to Americans since the early days of the republic when it was promulgated in particular by Thomas Jefferson. With their democratic ideals and institutions, Americans felt themselves natural heirs to ancient Greek and Roman traditions as well as their architectural forms. The classic Greek Temple front is seen on court houses, capitol buildings as well as middle class houses. The style takes its name from the Ecole des Beaux-Arts in Paris, where some of America’s most prominent architects had studied. Its grandiose use of classical forms was employed to great popular success at the World’s Columbian Exposition in Chicago in 1893 and became an ideal medium to express corporate wealth or civic pride. 7. 6841 S. Bennett Ave. Among the unusual features of this eclectic house are brickwork that imitates half-timbering and terra-cotta plaques (more commonly found on commercial buildings) stuck like postage stamps on the piers. Of all the early twentieth-century styles – Prairie, Craftsman, Art Deco – that deliberately rejected past history and sought to be timely and modern, the most radically iconoclastic was the International Style of the 1930s. Many of the world-class architects of European origin who also worked in the United States, among them Walter Gropius, Ludwig Mies van der Rohe, and Marcel Breuer, initiated their practices working in the International Style, generally characterized by a stark simplicity devoid of applied ornamentation. Ribbon windows were an important trait of this style as were corner windows in which the glass was mitered without any corner support. Other design features were flat roof tops and smooth, uniform wall surfaces. Return to your car on S. Cregier Ave. and head over to the South Shore Cultural Center. 9. South Shore Cultural Center, 7059 S. South Shore Dr. The South Shore Cultural Center was originally designed as a private club, the South Shore Country Club, by the architectural firm of Marshall and Fox. The architects renowned for their hotel and apartment building designs throughout the Chicagoland area, Marshall and Fox are best known for their design of the Drake and Blackstone Hotels. They constructed the original South Shore Club House in 1906 in the Italian Resort Style, resembling a summer palace. Of the original structure, the only remaining portion is the ballroom (now Paul Robeson Theatre) on the south end of the existing building. In 1916, after expansion in membership and social importance in Chicago, the old clubhouse was moved to the south section of the grounds and became the golf club house (no longer in existence). Marshall and Fox were hired again to design a new clubhouse. For decades, the South Shore Country Club was a playground for Chicago’s rich. In the 1960’s, the club was abandoned and fell into disrepair. Over the next few years, community activists pushed to have the club restored and in 1974, the Chicago Park District purchased the club for $10 million. The site became listed on the National Register of Historic Places in 1975. 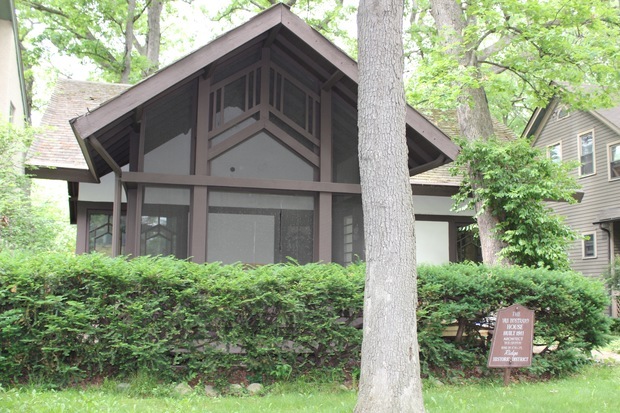 In 1984, the Chicago Park District rehabilitated the club house using interior color schemes developed by the original architects, Marshall and Fox. 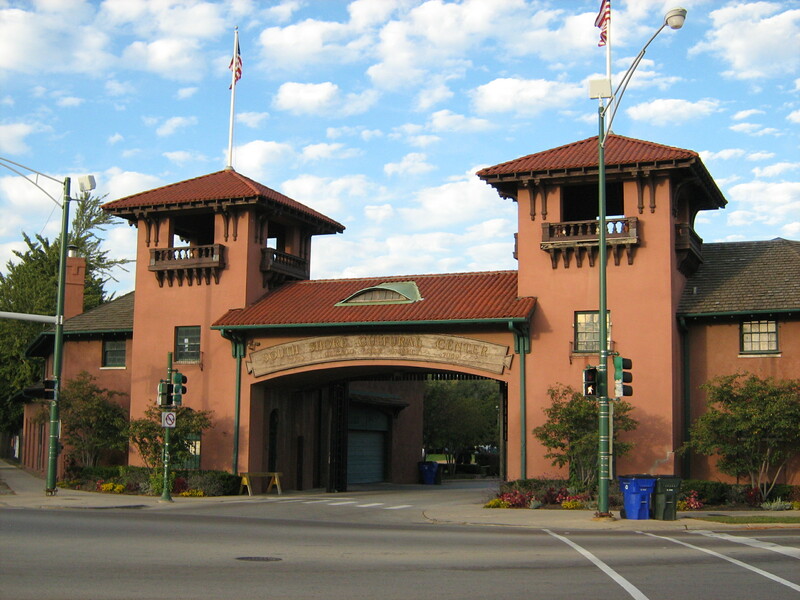 Today, the South Shore Cultural Center is one of the Chicago Park District’s most significant historical sites. The center sits on 58 acres of land and is a common space for weddings, banquets and cultural activities. President Barack Obama and First Lady Michelle Obama had their wedding reception here. The Parrot Cage Restaurant, run by the Washburne Culinary Institute, also is housed here. How we got there: I’ve done this walk several times and always found street parking. It is best to park somewhere near the actual Wicker Park, as that is where the walk starts. If you can’t find street parking, you can go to Spot Hero or a parking app to find a space. The area is well served by the “L” and bus if you prefer to take public transportation. To get there on the “L”, take the Blue Line and get off at the Damen stop. Comments from Marge: This is a great walk for seeing historical homes and learning the history of the area. I like to bring out of town guests on this walk because it is so interesting and, at 1.43 miles, is short and sweet. Afterwards, we can stop in at any of Wicker Park’s wonderful restaurants for lunch or dinner. Comments from Ed: Stately mansions with lush lawns side by side with urban grit. Hipsters and young families have invaded this quiet historic neighborhood. It is the pretense, but not the setting, for the 2004 thriller Wicker Park. This delightful little walk is perfect for tourists, out-of-town guests, or even a “date” walk. Full of pleasant surprises. Wicker Park, along with adjacent Bucktown, is mostly known today as a place to shop at edgy clothing boutiques or try out the latest hip restaurant. This tour takes you along the residential side streets that many tourists overlook but that testify to the rich history of this neighborhood. Middle-class artisans, mostly Germans and Scandinavians, began settling here around 1870. In the following decades, wealthy families whose foreign roots made them unwelcome along the Gold Coast built luxurious homes here as well. In the 20th century, the neighborhood’s respectability gradually declined, and many of the grandest homes were converted into rooming houses. It was not until the 1980s that the distinctive homes here began to be rediscovered and renovated, just as the gritty main streets of Milwaukee and Damen avenues began sprouting new shops and cafes. Two brothers who were beginning to develop their extensive real estate holdings in the area donated this land to the city in 1870, hoping the green space would make the surrounding area more attractive to prospective builders. Unfortunately, little remains of the 19th-century landscaping, which once included a pond spanned by a rustic bridge. Built in 1886 for a ship’s captain and a medical doctor, this double home reflects the fashionable Second Empire style. The building became a rooming house in the 1920s but has been restored to its original style. Note the lively Victorian colors of the cornices, tower, and trim. Other distinctive features are the large mansard roof and the decorative saw-toothed pattern in the brickwork. 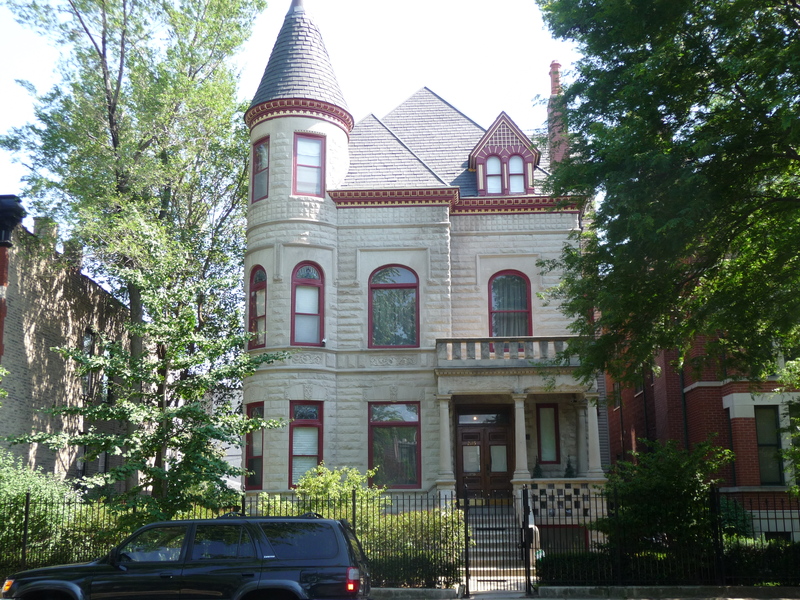 Built for clothing manufacturer Harris Cohn in 1888, this home is also known as the Wicker Park Castle. Essentially Queen Anne in design, its limestone facade made it pricier and more luxurious than its neighbors. Granite columns were polished to look like marble, and a turret rests on a shell-shaped base. Novelist Nelson Algren lived in a third-floor apartment here from 1959 to 1975. After he was caught stealing a typewriter in 1933, Algren (1909-81) spent 3 months in jail. This experience, which brought him in contact with criminals, outsiders, drug addicts, and prostitutes, was a strong influence on his work. Algren is best remembered for his two dark novels of the urban semiunderworld, A Walk on the Wild Side and The Man with the Golden Arm (which was set near here, around Division St. and Milwaukee Ave.), and for his tough but lyrical prose poem Chicago: City on the Make. Built by German wine and beer merchant John H. Rapp in 1880, this was the largest single-family estate in Wicker Park at the time. The original coach house, behind the mansion, is now a separate residence. This was not a happy home. Mrs. Rapp went insane, a son was convicted of embezzlement, and Rapp was murdered by his female bookkeeper. The home itself is of Second Empire style, with a large, curved mansard roof. The original wrought-iron fence defines the boundaries of the original grounds. The building permit for this Queen Anne-style home was issued in 1877, making it one of the oldest homes in the area. 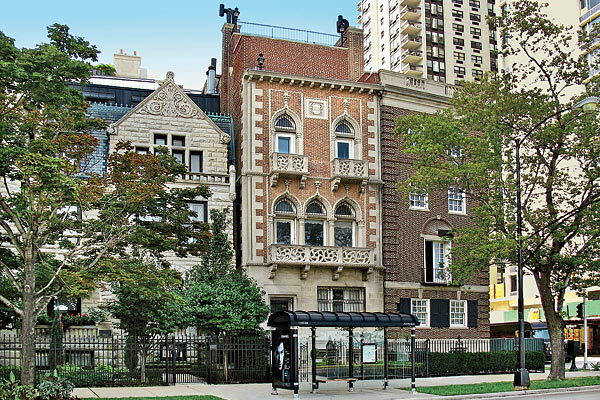 It was built for C. Hermann Plautz, founder of the Chicago Drug and Chemical Company. Ever conscious of the Great Chicago Fire, the builders created all the decorative trim on both towers, the cornices, and the conservatory of the south side from ornamental pressed metal. The seemingly misplaced cannon in the front yard is a relic of the years (1927-72) when the building housed the local American Legion. This well-preserved gem is one of the highlights of historic Wicker Park. Built for the German businessman Hermann Weinhardt in 1888, it’s a fanciful combination of elements that defies categorization. Notable details include the elaborate carved-wood balcony and the unusual juxtaposition of green stone and redbrick limestone around the large front window. The large lot used to be flooded in the winter for ice-skating. 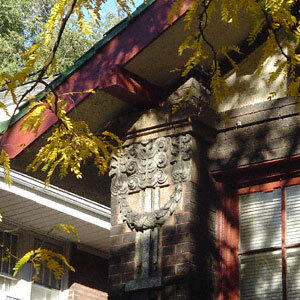 The original owner of this home, Hans D. Runge, was treasurer of a wood milling company, so it’s no surprise that elaborate wood carvings characterize the home inside and out; among the unique designs are the Masonic symbols flanking the pair of dragon heads under the rounded arch. A well-heeled local banker and politician, John F. Smulski, acquired the house in 1902, about the time many Poles were moving into the neighborhood. Smulski committed suicide here after the stock market crash in 1929, and the house served for a time as the Polish consulate. These public baths were built in the 1920s and were reportedly once a hangout for local politicians and wheeler-dealers. Today the building has been transformed into — what else? — condos. Still, it’s a fitting end to the tour, a reminder of the days when this was a neighborhood of European immigrants trading news from home in the Luxor Baths steam room. Head east to the three-way intersection of Milwaukee, Damen, and North avenues. From here, you can hop on the Blue Line El train, or grab a bite to eat or return to your car.